This beautiful arrangement is highlighted with a unique matting construction technique called Tatami. 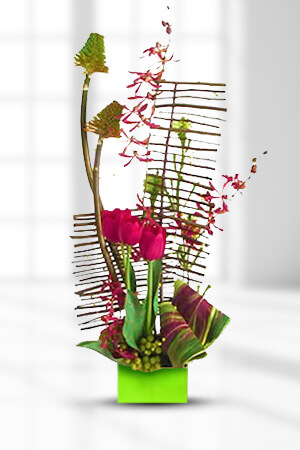 Your special someone should find its lovely autumn colours and striking design to be very pleasing. It's a sure success!Make your recipient extra happy by adding a Standard box of chocolates to your order and you can be sure to be popular for a long, long time! This time, there was Tatami making florist locally! Easy to order and the flowers arrived on time, as promised. Mum said the man that delivered the flowers was polite and super nice and she LOVED the flowers. I would have liked a clear idea of when they were to be delivered and in hindsight I should have organised to have them delivered the day before so they were with her in the morning of. Thank you so much. Very helpful and quick to communicate, lovely products. quick and easy, with no hassle at all. Awesome job on the flowers. Your the zFlowers.com even you substitute the flowers it still looks great.